Deep learning is a part of machine learning methods where neural networks, algorithms, inspired by human brain learn from large amount of datasets. Similarly how a human being learn from his past experiences, deep learning algorithms will perform some task repeatedly to produce an improved outcome in each run. The more deep learning algorithms learn, the better they perform.It can be considered to automate the predictive analytics. In this article, we will be covering below topics to gain in-depth knowledge on TensorFlow. How to install TensorFlow on your system? How to build and run a Computational Graph? TensorFlow is an open source machine learning library, invented by Google, and used to design, construct, and train deep learning models. TensorFlow is a library for dataflow programming. It has numerous optimization techniques to make mathematical expressions’ complexity easier and more performant. It works efficiently with mathematical expressions of multi-dimensional arrays. It has GPU/CPU computing due to which we can execute the same code on both architectures. It is highly scalable for computations across machines and large datasets. Altogether, these key features make TensorFlow shine as a perfect framework for machine intelligence. 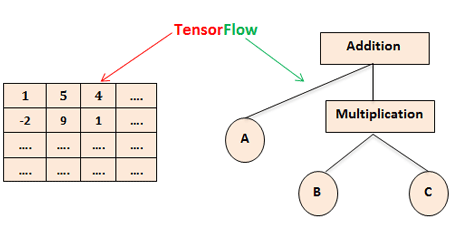 Before understanding TensorFlow and how it works, let us first understand what actually a Tensor is. A tensor is a mathematical representation of a physical entity which can be described in multiple directions or magnitude. Tensors are multidimensional arrays of base data types. Each element in Tensor is of the same datatype. Tensor consists of 2 main properties: Data Type and Shape. Tensor’s data type is always known whereas its shape can be known partially. 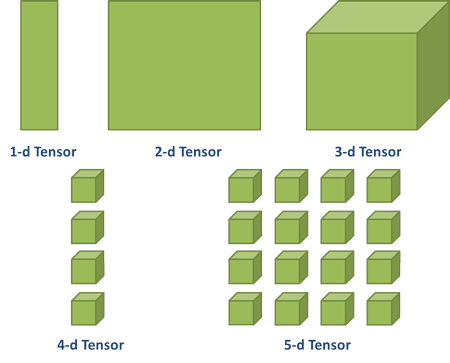 Tensor shape is defined as a number of dimensions it has and size of each dimension. 0 Scalar (magnitude only)  0-D A 0-D tensor. A scalar. 1 Vector (magnitude and direction) [D0] 1-D A 1-D tensor with shape . 3 3-Tensor (cube of numbers) [D0,D1,D2] 3-D A 3-D tensor with shape [1, 4, 3]. N n-Tensor [D0,D1,D2,…..,Dn-1) n-D A tensor with shape [D0, D1, ... Dn-1]. Now, as we are aware of what TensorFlow is, let’s first install the library to kick start learning. Download a version of TensorFlow which enables us to write the code for deep learning projects in Python. This is easily available on TensorFlow’s website. On this website, multiple ways are available to install TensorFlow such as using pip, Docker, etc. TensorFlow provides API for various programming languages like Python, Java, Go, Rust, Haskell, C++ and R.
TensorFlow is made up of Tensor and Flow. Tensor is a representation of data into multidimensional arrays. Flow is defined as sequences of operations performed on these Tensors. Let us explore what data flow graphs are. Computations are represented as data flow graphs. Edges are Tensors flowing through the graph, (multidimensional arrays) whereas nodes are operations. 1. Normal Edges: They transfer tensors and output of one operation can become input for another. Here the data type is optional. If we don’t define any variable’s data type, TensorFlow will decide the type of variable from the initialized value. A placeholder tensor must feed with data while runtime else flow will generate an error. Placeholders make the computation graph generic in nature. We can run the same code with different values multiple times without re-writing same code again and again for different values. Any computation graph running in a session will evaluate actual values of nodes. A session is defined as the state and control of TensorFlow runtime. It stores in which order all operations will be performed and pass the result of one node to next node in the pipeline. A computational graph is a directed graph where nodes are variables and edges are operations on those variables. Operations are fed with variable values and they can transfer their output to other operations as well. These values which fed into nodes and come out of nodes are called Tensors. This computational graph computes the sum of input variables a and b and store it into c. Computational graphs provide an alternative way to perform mathematical calculations. The operations assigned to different nodes can be performed in parallel which improves performance in computations. This concept shows its usefulness when computations become more complex. For example: linear regression model expression c(A,x,b) = Ax + b. We will see how we create linear regression computation graph further in this article. To run a computational graph, we need a session to execute operations. Session provides control and state of TensorFlow runtime. Session contains the sequence of operations and passes the result of one computation to another. This is how a computation graph works in a session. While building the graph, we need to make sure the operations are in a correct order. Now, let’s implement code for this TensorFlow. How far is our computed output with desired or targeted output? We need to give a proper mechanism through which our model train itself based on given inputs and respective outputs. For model validation, we are using Loss function which compares our training model outputs with desired or targeted outputs. 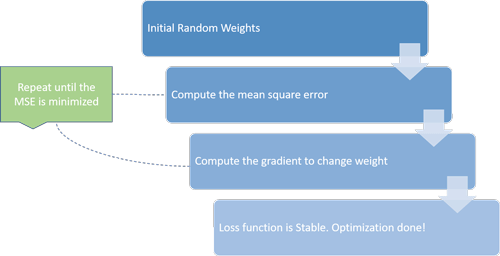 There is a most common loss function for linear regression model called S.S.E. (Sum of Squared Error). If we are getting high loss value, then we need to adjust our scalar variable bias and weight variable to decrease the error we are getting. Gradient descent will iterate the process until the error is reduced. Each process is termed as an iteration. If learning rate is too small, then algorithms will take a long time to converge as it requires lot of iterations. If learning rate is too high then algorithms might never converge. 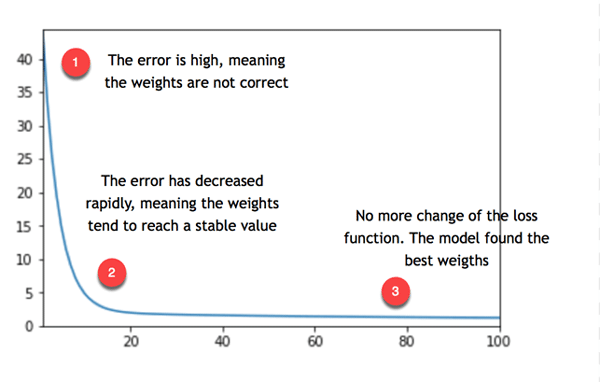 Model is repeating their process until its weights reach to a stable value. If error is not 0 and it stabilized around different number like 5, as shown in this picture, that means the model is making a typical error as 5. To reduce it, we need to add some more information to model, like more variables or estimators. So, this is how we can build a linear regression model and train it for desired output. TensorFlow is a powerful framework which makes working with mathematical expressions and multi-dimensional arrays easier which is the most important aspect of machine learning. It also reduces the complexities of scaling and executing data graphs. In the course of time, TensorFlow has become popular and now majorly used by developers for solving problems using deep learning methods for video detection, image recognition, text processing like sentiment analysis etc. TensorFlow has great documentation and community support. If we follow that, it will become a less tedious process to solve the problems with TensorFlow. TensorFlow is used by all major Tech giants like Dropbox, Snapchat, twitter, Airbnb, eBay, SAP, IBM, Uber, Qualcomm for image recognition. Moreover, Facebook, Google, Instagram and Amazon also use TensorFlow for different purposes. Most of all tech companies are using it in one or another way. This can be the biggest reason to learn and know more about TensorFlow. Now that you know about the importance of Deep Learning and TensorFlow, check out Mindmajix course to learn TensorFlow in detail and crack the interview at your dream company.